The locals of Manitoulin Island are more than familiar with the legendary Haweater Weekend. Thousands of people come to the island to partake in the August long weekend celebrations. Crowds of people brave the traffic, filling up the campgrounds scattered across the island or comfortably settling into their own cottages. Perhaps you have previously joined in on some of the weekend events, like the cardboard boat races. Maybe you've watched the stunning fireworks display, popping and lighting up the night sky. You've certainly noticed the throngs of people walking the streets - circling the vendor stands, donning Haweater T-shirts and clutching bouquets of cotton candy. Everyone wants to make the most out of their long weekend holidays. Do you know about all the events happening in town? We're here to answer all your questions and more. When people began settling on Manitoulin Island, it is believed that they ate a great amount of hawberries from the hawthorn vegetation is are so prevalent across the island, to prevent starvation and scurvy. Eventually, the residents of the island begin to identify with the nickname "Haweaters," as a nod to the fascinating and resilient history of the island. The name Haweater refers to those who are born on Manitoulin, but if you move here for a long period of time you are deemed an honorary Haweater. Haweater Weekend is the island's cultural festival that has been around since 1967, originating as a homecoming weekend. Now, 51 years later, the main focus is on drawing tourists to the island to share the colourful culture, unique local businesses, and fun-filled events. The Lions Club of Little Current run the event weekend with the hard work and diligence of their volunteers. The money raised from the weekend is put right back into the community. Since last August, the Lions Club has donated over $90,000. The festivities run from Wednesday, August 1 to Sunday, August 5. The weekend is jam-packed with exciting events: water sports, cardboard boat races, face painting, beach volleyball, live music, a magic show, dances, yoga on the docks, and of course the grand fireworks display. The downtown traffic is blocked off, and the streets overflow with vendors and sidewalk sales. You can check the full event schedule on the Lions Club website. The fireworks show is an incredible thing to experience. Beautiful flashes of colour erupt over the water, illuminating the astonished faces of the hundreds of spectators. Many people claim that it is the best fireworks display they have ever seen. Suffice to say, people will not be disappointed. Which events should I go to? The correct answer is that you should try to check out every event! There are so many great events happening around town, it is difficult to narrow it down. Here are a few events that are fun for the whole family! Artists from the HGTV show, Carver Kings, will be performing in the arena parking lot all day. They will be displaying their carving talents, creating unique custom art pieces with their chain saws. It is a marvellous act to experience - beautiful, intricate designs carved out of raw wood. They'll be here until Tuesday! At 5pm the Rainbow Country Cruisers are sponsoring an amazing car show - check out all the beautiful classic cars downtown, on the east end of Water Street. This special event is a cherished tradition of Haweater Weekend. If you can't make it on Friday, there will be even more cars to admire on Saturday starting at 10am! From 9am to 12pm you can participate in the soap box races! If you're between the ages of 5 and 11, of course. It's a fantastic event for the family to enjoy - the kids have a blast racing in the prebuilt cars, and the parents get to cheer on their children. This event will be held at the Gateway to Life Church parking lot. Make sure to bring your own helmet! Beginning at 11am, you can try a free Zumba class for adults! It's held on the curling club ice surface. Beginners are welcome and even encouraged - come out to this awesome event; try something new, have a great time laughing and learning this crazy fitness class! At 12:30pm there is the annual cardboard boat races at Lows Island park. This event is an amazingly fun time - build your own boat, bring it to the event and see if it sinks or swims. There are great prizes involved, on top of the thrill of getting to race your very own boat to victory! At noon there will be face painting, held at the cenotaph downtown (the statue commemorating soldiers). Or, if you're feeling competitive, you can register for the beach volleyball tournament at the Low Island volleyball courts. Come and see the Haweater Parade at noon! It begins at Harbour View road, and snakes through the town. Many local businesses are involved in the parade, and it's always a great time to watch the stunning floats go past, waving and cheering amidst happy music and candy. From 2pm to 4pm there is kayak and canoe races. There are different age categories, so everyone can participate! Registration is from 12:30pm to 1:30pm at the Low Island Pavilion. It isn't Haweater Weekend without the big finale: the beautiful fireworks show at the water. Sit on the docks and watch the amazing display. It begins at dusk, of course, and is weather dependant! Where should I eat this weekend? Well, that's an easy question - 3 Cows and a Cone is definitely the best place to eat on Haweater Weekend! Over 32 flavours of delicious ice cream, waiting to be scooped and served to eager customers. Hot, cheesy pizza that melts in your mouth. Crunchy sub sandwiches, topped with all your favourite sauces and veggies. All the food is made to order, so you'll always be given the freshest meals possible. It's a fun, happy environment that has become a tradition of visiting Manitoulin Island. Of course, we can't forget about the chip truck next door, 3 Cows Fries. They serve irresistible specialty poutines, including the ever-changing Poutine of the Week. Manitoulin whitefish, bassa, smelts, fresh cut fries...and you can eat it all under a shady umbrella at one of the picnic tables. The current Poutine of the Week is the Haweater Poutine. 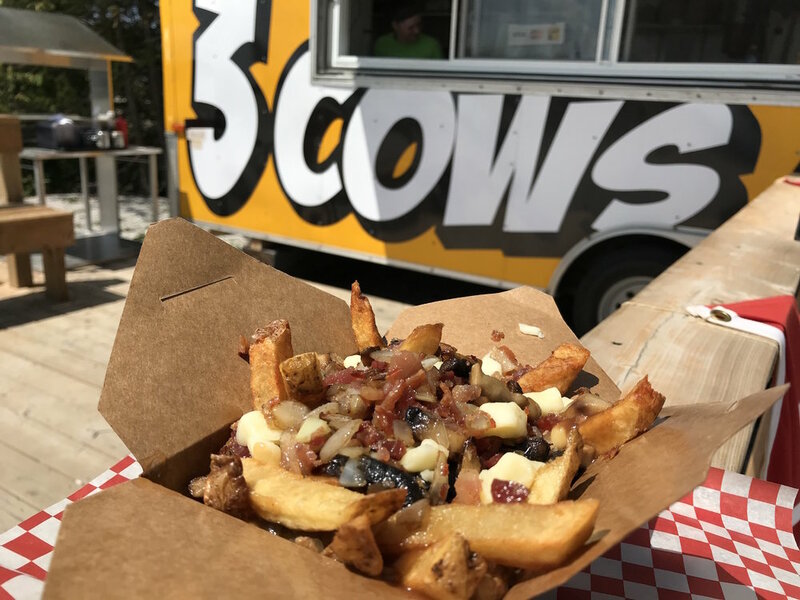 Delicious fried onions, mushrooms and hot juicy bacon nestled in a bed of fresh cut fries, tasty poutine sauce, and cheese curds. This amazing poutine will explode with flavour in your mouth. Any advice for the upcoming weekend? It is important for everyone to be responsible, don't drink and drive, and be respectful to the nearby properties. The local police work hard to ensure that everyone remains safe and preventable accidents are avoided. The police incident numbers have indeed decreased in recent years, which is a positive improvement. Little Current is always very welcoming to visitors and tourists, but it the most important thing is that everyone celebrates safely. The best thing we can all do is have fun, as many people put a lot of effort towards the safety and enjoyment of the Haweater Weekend celebrators. So let's have a great time and celebrate the island we all love so much! We wish everyone a happy Haweater Weekend!